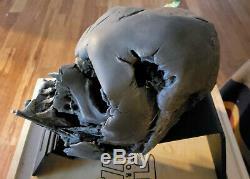 Darth Vader Helmet (Melted) "ULTIMATE STUDIO EDITION" by PROPSHOP! #9 of <500 limited edition. Insanely rare and hard to find! I pre-ordered that day as I felt they were going to be something special. And they are simply stunning. My first day pre-order is how I ended up with #9 of the lot! 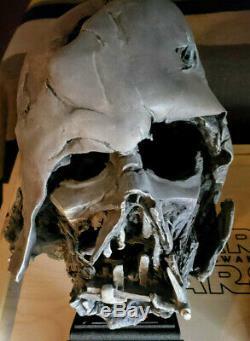 From my understanding, PropShop is the (now-defunct) company that made props for the "The Force Awakens" movie, which means this helmet was made in the same place, with the same tools, by the same people, as the helmet that you see in the actual movie. 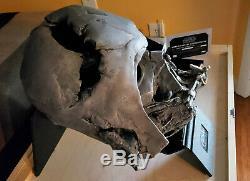 Instead I will suggest you search online for " star wars propshop review". The first page of results will contain unboxing/review videos from other customers, and links to stories about these items and propshop closing. Just this one phrase will get you all of that so dig in! However it can still be viewed via archive. 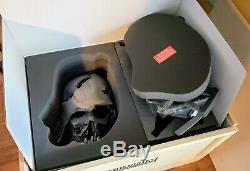 All of the helmets are wearable and life size , except the Darth Vader one since it is "melted" , although they are not meant to be worn as part of a costume since they are collector's items. Because of the value and rarity of these helmets it's very hard to part ways with them "them" as in I also have the Kylo Ren helmet - see link below! But as my collection has grown, the need to get rid of some of my bigger things has been prioritized. Including packaging, this thing takes up a lot of space. It has been very well taken care of and is in mint condition, with no blemishes, scratches, or defects that I'm aware of (other than those that are part of the design). Please take a look at the pictures to see for yourself. 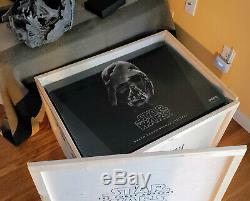 When it wasn't on display, it was stored inside it's retail box in a closet. 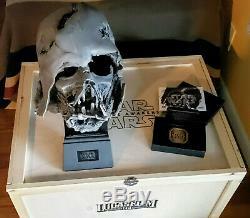 In addition to the helmet, the box also contains a stand to put the helmet on, and a small box with the certificate of authenticity paper + medallion. The packaging is an amazing display piece in itself: a Lucasfilm wooden archive box that feels like something from the end of Indiana Jones. These are all shown in the photos so take a look. All photos show the actual helmet that I own and that you will be getting, except the photo with a black background which is a stock photo. NO EXCEPTIONS, PLEASE DON'T ASK. Just have the Vader one left. From the official archived page above. 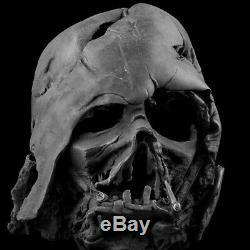 Own a piece of the epic saga with our exclusive, made-to-order replica of Darth Vaders Melted Helmet from Star Wars: The Force Awakens. The Sith Lords iconic helmet is precisely detailed in every way and appears virtually identical to the prop used in the film. Created using the original 3D digital data from the actual prop featured in the film in combination with advanced digital manufacturing processes, and then hand-finished by a highly skilled artisan. The surface markings have been projected onto this helmet to identically recreate the texture pattern of the original. 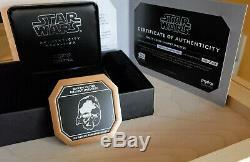 Includes a chip to authenticate the serial number that is printed on the Certificate of Authenticity. Delivered in an exclusive, custom wooden crate inspired by the packaging used for the original prop. Certificate of Authenticity and Authenticity Medallion included. 53 L x 30 W x 45cm H. Product weight with stand: 3600g. Product weight without stand: 600g. This is not a toy. It is not meant to be worn as a costume, and does not contain any moving parts. 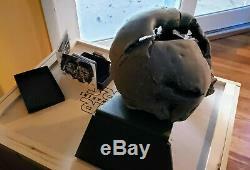 The item "Star Wars PropShop Ultimate Studio Edition Darth Vader Helmet (Melted) #9 / 500" is in sale since Tuesday, February 19, 2019. This item is in the category "Collectibles\Science Fiction & Horror\Star Wars\Products, Non-Film Specific\Costumes, Masks". The seller is "mamz10k" and is located in Lake Oswego, Oregon. This item can be shipped to United States.